Monday August 20, 2018 - Deputy President William Ruto has accused NASA principals, Raila Odinga and Musalia Mudavadi, of betraying and abandoning him after the 2007 General Elections when they were all in the Orange party. 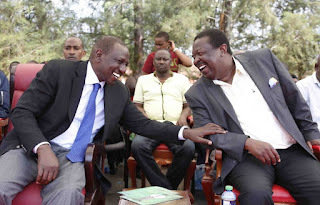 Speaking yesterday, Ruto claimed that there was a pre-election agreement where he would become the Prime Minister while Mr. Mudavadi would be the Vice President if Raila Odinga had beaten Mwai Kibaki in the Presidential race. Ruto noted that the ODM top brass team dubbed the entire Pentagon that also included Joe Nyagah, Najib Balala and Charity Ngilu, knew. According to the DP, the ODM Pentagon was to share among themselves top Government positions, had ODM defeated Kibaki’s Party of National Unity (PNU). “Raila became Prime Minister and Musalia, the Deputy Prime Minister,” said Ruto.